The good: There's no use beating around the bush - I am totally addicted to the Elemental series. I knew as much when I sped through Storm but really, Spark is the one that solidified me as a fan. And if you're asking yourself why. I've got two words for you. We get a glimpse of Gabriel's character in Storm and even then, I was intrigued by him. His element is fire which goes really well with his temperamental personality. He's quick to fight, which can be good or bad depending on who you are. He's loyal and will defend any of his brothers (and the people they care about) without hesitation but also quick to lash out when he's hurt. These characteristics really came to the forefront in Spark. Of the brothers, he's more damaged and complex (from what I can tell so far). There's so much emotion beneath the surface of his angry act. That's why I liked getting inside his head. It's also what made his relationship with Layne, a girl in his class that he gets to know, so enjoyable. Aside from their chemistry (um, hot! ), she gets him to let down his walls. It's by no means easy and she's got baggage of her own that eventually gets revealed. So there's a lot of push and pull between them but they get each other. And I found myself falling for Gabriel along with Layne. I loved both of their characters. But everyone from the first book -- his brothers, Becca, Hunter, Quinn, plus a couple others -- are still very much a part of the story. It may seem like Gabriel and Layne's relationship is the focus, but there is a lot going on, with action and twists and turns that I didn't see coming. (No) reservations: Nothing but fangirling over here. Do I recommend? : This is definitely for fans of paranormal romance (emphasis on the romance) with engaging writing and characters you can't help but want to know. I think it's a really fun series that's just the right mix of supernatural with contemporary themes, so if this sounds like something you'd be into, pick this up ASAP! SERIOUSLY. This book was so awesome! 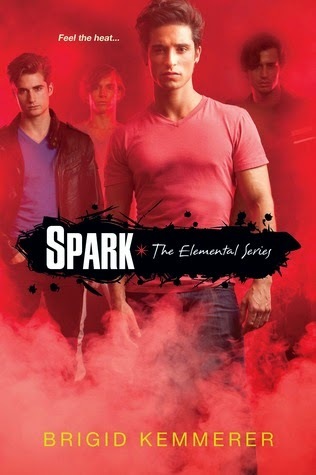 It's still holding the position of my favorite novel in the Elementals series. And I can certainly see Gabriel's everlasting appeal after reading this. ALL THE SWOONS for him!